System must have ¾-inch or 1-inch pipe made of either copper, PVC, PEX, or SDR9 Poly. For 1-inch PVC pipe, 1-inch copper or Poly pipe, and ¾-inch PVC pipe, you will need 14 inches of straight pipe between the backflow preventer and valve box. For ¾-inch copper or Poly pipe, you will need 16 inches of straight pipe between the backflow preventer and valve box. 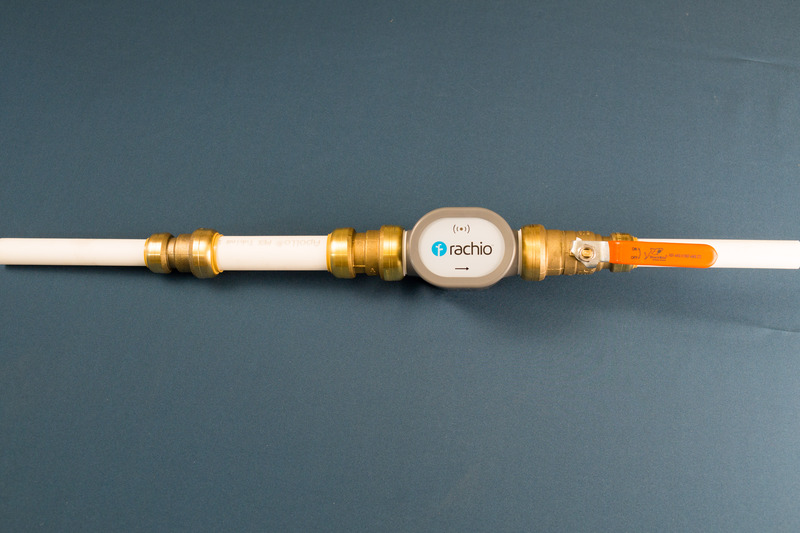 The following Rachio Wireless Flow Meter installation instructions are intended only for irrigation systems with 3/4 inch PEX pipe. If your system uses a different pipe size and/or material, please visit rachio.com/flow for instructions tailored for your system. Sharkbite brand, SKU # U060LF. Available at Home Depot, Supply House, and Amazon. Sharkbite brand, SKU # UIP4020. Available at Home Depot, Lowe's, Supply House, and Amazon. Sharkbite brand, SKU # 25551LF. Available at Home Depot, Lowe’s, Supply House, and Amazon. A 6-inch cut piece of 1-inch PEX pipe, available at any Home Depot (you may need to purchase a longer piece and cut it yourself). Note: For accurate flow measurement, there must be 6 inches of 1-inch pipe before the Flow Meter. Do not attempt to bypass adding the 1-inch transition pipe, as this piece is essential for proper installation. For PEX pipe: Folding Jab Saw (or Jab saw), model # 48-22-0305, available at Home Depot and Amazon. Push the ¾-inch copper to 1-inch copper Sharkbite fitting onto one side of the copper pipe transition (the 6-inch cut piece). Push the 1-inch copper to 1-inch copper Sharkbite fitting onto the other side of the copper pipe transition. Important: Push the 1-inch PVC to ¾-inch copper Sharkbite fitting onto the end of the flow meter so that the arrows on the flow meter point to the fitting. Use a twisting action until the pipe or flow meter are seated against the thin ring (tube stop) inside the fittings. Push the 1-inch Sharkbite fitting on the transition pipe onto the flow meter. Use a twisting action until the flow meter is seated against the thin ring (tube stop) inside the fitting. Identify 16 inches of continuous straight pipe between the backflow preventer and the valve box. Mark 2 inches after the start of continuous pipe (this is often after a joint); this will be the top cut. Mark 13 ½ inches after the first mark; this will be the bottom cut. If you are not using Rachio-recommended fittings, please use your fittings’ specs to complete installation. Some water may leak out of the cut. Push the flow meter, fittings, PVC addition and pipe together firmly while twisting the fittings to the insertion marks. Your flow meter is now reporting actual water usage.